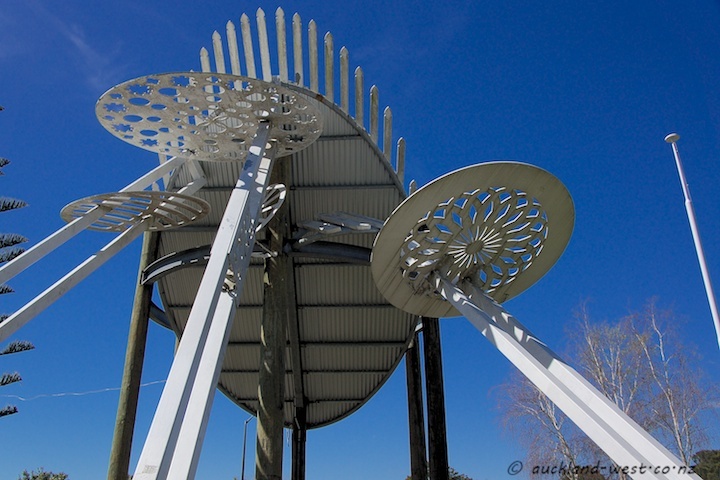 This sculpture by John Lyall was commissioned for the Jack Pringle Village Green in Te Atatu. Circles and ellipses and lace patterns – not to forget the picket fence. There are more John Lyall sculptures at that place, and more of his work has appeared on this blog. Interesting sculpture & beautiful blue sky. Great photo for SWF!Have a nice weekend. That’s a beauty. Really fascinating sculpture. The radiance of the blue sky adds a beautiful contrast to this fascinating sculpture.